Lackawanna is historic streetcar suburb on Jacksonville’s westside that largely developed as a result of railroad growth and investment in the area, dating back to the days of the Florida Central Railroad. Lackawanna is located on the westside of Jacksonville and bounded by a CSX railroad line, Hollybrook Park, Interstate 10 and Cassat/Edgewood Avenue. Once owned by notorious carpetbagger George William Swepson, a swindler notable for his involvement in the 1868 North Carolina railroad bonds scandal, the railroad line ran between Jacksonville and Quincy when it was acquired by Sir Edward Reed in 1882 and renamed the Florida Central and Western Railroad. Additional acquisitions added to Reed’s railroad empire, resulting in the line being rebranded as the Florida Central and Peninsular Railroad (FC&P) in 1888. During the 1890s, the FC&P invested in a railyard and shops along their line on the outskirts of the city. In 1900, the FC&P contracted with the Seaboard Air Line Railway (SAL), allowing SAL to operate their railroad line and railroad shops near McDuff Street. After the Great Fire of 1901, rebuilding efforts led to rapid residential construction beginning to spread out in all directions from downtown Jacksonville. This, along withSAL acquiring the FC&P and expanding its maintenance shop in 1903, led to the platting of Lackawanna between 1904 and 1907. To connect the shops and neighborhood with downtown, a streetcar line was constructed along Lackawanna Avenue (present day Edison Avenue). Lackawanna’s Seaboard Air Line Shops and Terminals once included diesel locomotive shops, steam locomotive shops and a 165’ turntable. Operations ceased in 1985 and what remains of the adjacent West Jax Yard is primarily used for receiving Conrad Yelvington rock trains. By 1909, employing over 1,000, the SAL railroad shops had become one of the city’s largest employers. With the SAL serving as a major anchor and the Lackawanna car line offering 89 daily round trips with 15 minute headways to downtown, the neighborhood became an early 20th century epicenter for new development. Designed by African-American architect and Duval County School Board chief builder R.L. Brown, Lackawanna Elementary School (Public School Number 10) opened in 1911. In 1919, Jacksonville expanded its limits west to McDuff Avenue. 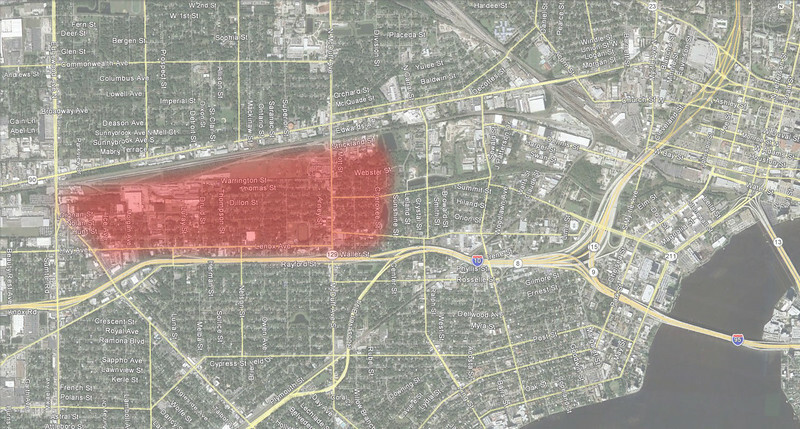 A second annexation in 1925, expanded city limits to Nelson Street, placing half of Lackawanna within the city. As a result, the City of Jacksonville invested in the community by opening Hollybrook Park in 1922 and Lackawanna Playfield in 1929. At the time, Lackawanna Playfield (renamed Mallison Park in 1968) was the city’s premier athletic facility, featuring a swimming pool, football field with an encircling cinder track and baseball field. During this time, anchored by the Lackawanna car line, McDuff Avenue developed into a walkable commercial district serving residents in the area. McDuff Electronics & Appliances, established in 1944 at the intersection of McDuff and Edison Avenues, would grow into a 235-store chain by the time it was acquired by Fort Worth-based Tandy Corporation in 1985. Continued growth led to the opening of a second neighborhood school, Pinedale Elementary School in 1956. 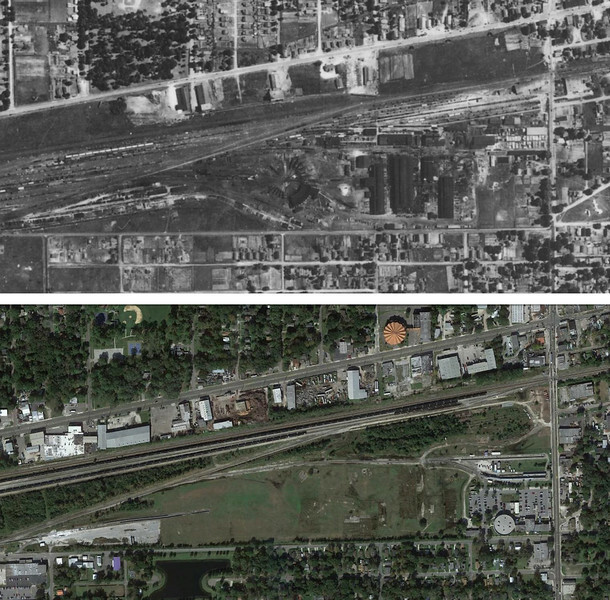 The neighborhood also benefited from additional industrial growth surrounding SAL’s West Jax railyard. By the 1960s, the list of companies operating in Lackawanna included Velda Farms, J&K Freezer, Sellers Bag Company, Apperson Chemical and All American Van and Storage Company.